Our plans for the bank holiday weekend are somewhat low-key having wiped ourselves out on our road trip across Europe (maternity leave has a lot to answer for) but just because we are not going to be going away for the weekend as we often used to, doesn't mean we can't have fun. We have one day out planned but other than that we are hoping to spend lots of time in the garden - our own mini 'playcation'. 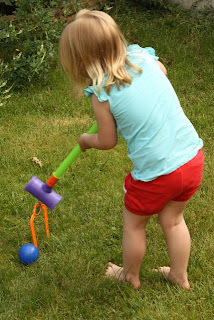 Since Lara was born over 3 years ago I have been stock-piling garden toys waiting for her to reach an age when she can really get involved with games in the garden because I have such great memories of summer holidays in my own back garden. Now that time has come and Lara loves rushing around the garden on her own, with us, or with friends. 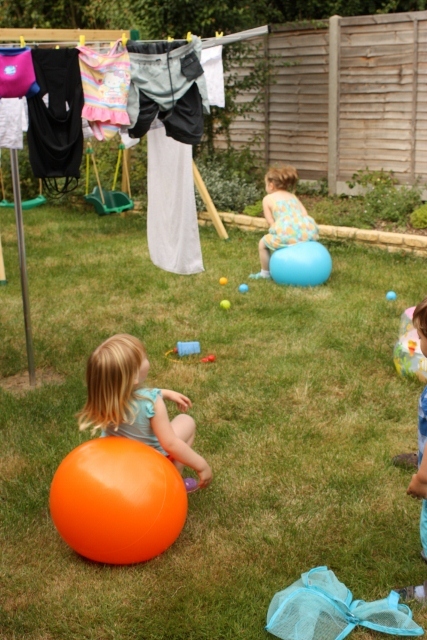 Garden games don't need to be expensive or sophisticated, we have inflatable footballs that I got free from the front of magazines, a bag of plastic balls for a fiver and a mini croquet set that Argos sent us (£3.99) to get the Playcation off to a start. Lara and her friends can screech and shout for hours in the garden! Argos sent me a set of top tips from Laura Hamilton (see the video below) of how to make the most of garden games so I set up an obstacle course in the garden which required sploshing in the paddling pool, bouncing around the washing line on our Argos hoppers and through the swings before accurately putting the ball through a croquet hoop! Other ideas include a treasure hunt - perhaps I'll set up one in the garden this weekend. You don't need a lot of space to get out and get active this bank holiday weekend - if your garden is not quite of obstacle-course proportions why not gather your friends or neighbours and each take along a toy or obstacle to the local park... I'm thinking It's A Knockout stylee!